The Campaign for the Protection of Rural England has managed to winkle information out of HS2 Ltd which has been kept secret so far, and clearly should have been made available during the public consultation for Phase 1 in 2011. Information relates to the impacts of construction and operation of HS2 and how the landscape will be affected. The information has seen the publication of impact maps which can be found at www.hs2maps.com. 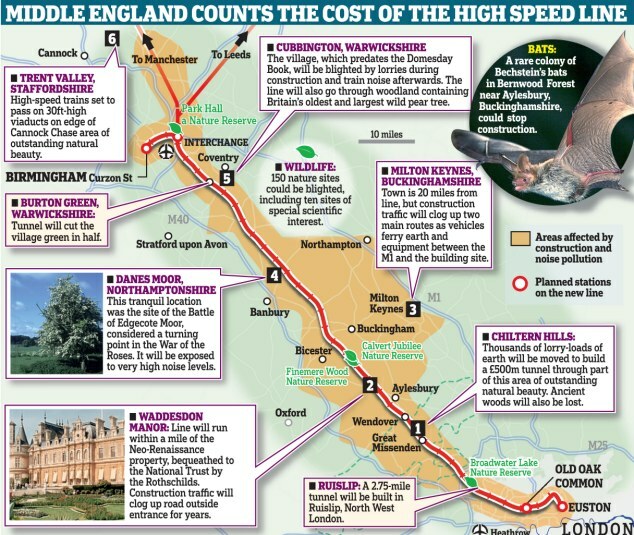 The biggest shock for many is just how many places will be affected by construction traffic for HS2. At the widest points construction vehicles will be coming from 25 miles away from the line, and covering a 40 mile envelope on either side. This report has been derived from information from HS2 Ltd, who have previously told anyone who asked that all construction traffic would only travel along the line of construction. The Mail on Sunday estimated that this could mean up to half a million people could be affected by the construction impacts. I wonder why CPRE chief executive Shaun Spiers seems blind to the consequences of HS2?Surely in his position he should not be backing such destruction or believing all the spin.